Motor camper, caravan and camping around Sidmouth. Also information on Sidmouth FolkWeek festival Bulverton campsite and festival bus services. Updated July 2018. You are advised to read this page carefully: there are many options. For people who don't fancy risking the 'official' (Bulverton) Sidmouth Folk Week campsite in bad weather, or who find the 'in town' campsites far too expensive, details of alternatives are given on this webpage. Please read all of this page carefully and notify me if you think there are any errors. In 2014 a new location was proposed for the official campsite - but the change never occurred - details here. Small private garden campsite at Sidford, 2 miles from Sidmouth town centre. Link to pay camping deposits via internet banking - click here. My front garden is primarily for motor homes or small caravans that have all their own facilities for washing etc. 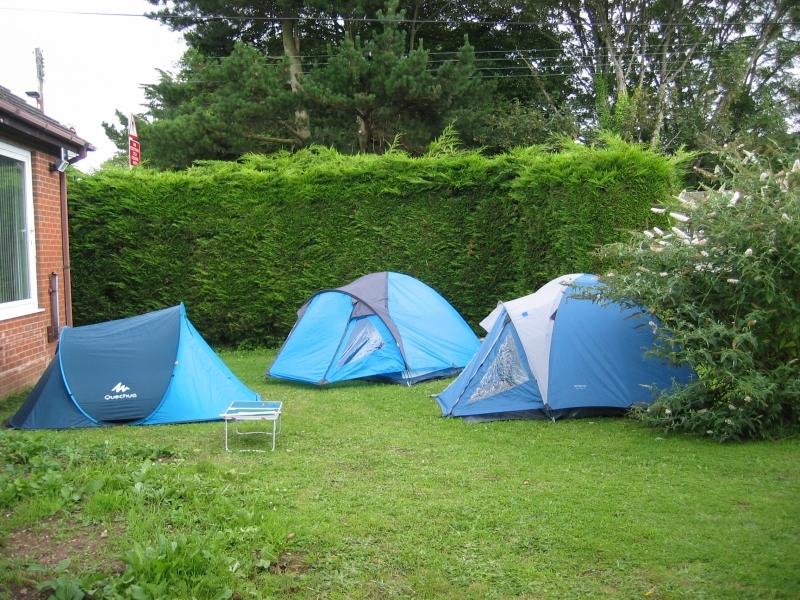 I also have space for tents in the rear garden - it is very scenic. Tourists take photos from the bridge by my garden. A deposit is required in the FolkWeek period. The principal advantage of my garden is that it is easy and safe to cycle into the centre of Sidmouth along a dedicated cycle track well away from motor traffic. It is also a pleasant safe walk into town (30 to 35 minutes) and a convenient location for shops and buses (every half hour into Sidmouth or Exeter). There are fields adjacent by the river for a dog to roam (subject to sheep, horses or cattle sometimes). There is a countryside walk into Sidmouth via fields and along the river. Lawn areas are irrigated using river water and so remain green during heatwaves (2018 for example). My garden is flat overall (unlike most of the FolkWeek campsite). You stay AT YOUR OWN RISK! Mains power available for motor-campers or caravans (at 13 amp only) via your own extension leads, again at your own risk (and via a dedicated 32 amp ELCB). Public toilets (locked up between 10 pm and 8 am) are available in the village centre two minutes walk away. A disposal point is available on site for your own chemical WC or similar system. Two pubs nearby. Cold mains water, recycling bins and landfill waste containers on site. There will be no access to facilities in my house but showers/WC are available on site - but only during certain hours. There is 24 hour free car parking on-road. Cars cannot normally be left on my driveway or in the front garden. Village shops are a minute away (SPAR with post office 7 days a week until 10pm), Waitrose is a 20 minute walk away, ditto LIDL. The only petrol station in Sidmouth is adjacent to LIDL. There is a regular bus service into the centre of Sidmouth and to Exeter, Seaton, Lyme Regis and Honiton (which is the nearest rail station). The bus link shows the location of LIDL etc. 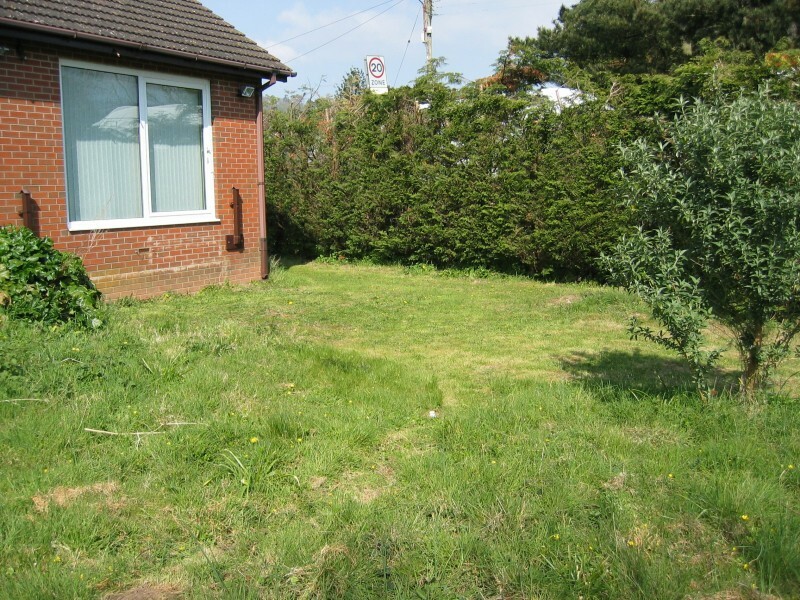 The overall space available in my front garden is about 6 metres by 13 metres (20 feet by 45 feet). Access for reversing a small caravan in from the road is easy, but a motor-mover is recommended. You assume all the risks. 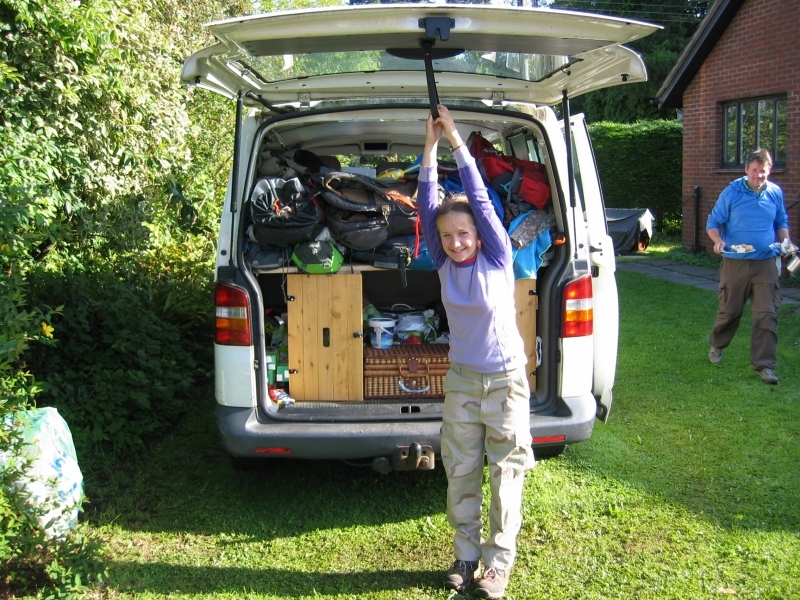 An 6.5 metre motor home can be reversed in easily. It is a quiet level road with no through traffic. 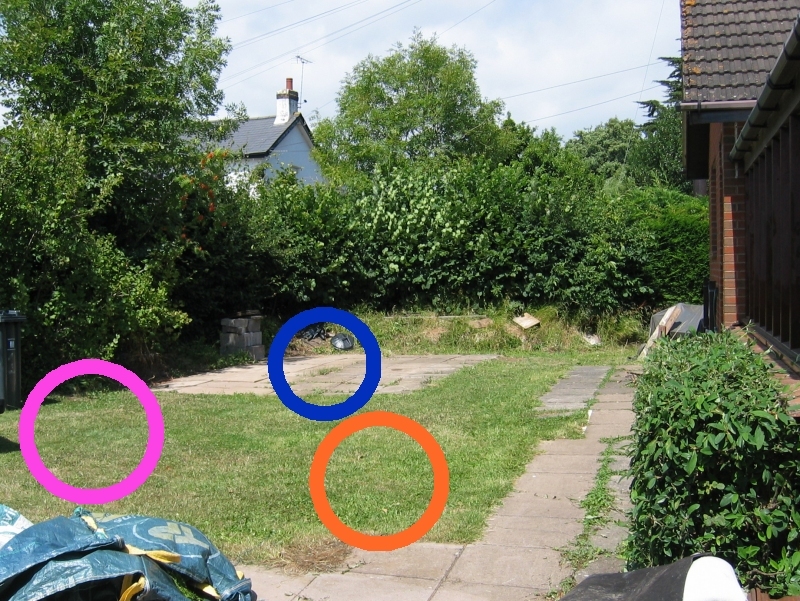 There are two areas of 2.5m by 6m for larger motorhomes - shown roughly by the blue and pink circles. Also room for one smaller motor-home on the grass - orange circle. Because the garden is close to the A3052 there is some traffic noise during a busy day but virtually none at night. Street lamps are on all night so the site is never in total darkness. The garden is screened by tall hedging. Children are OK at your risk - the river is at the bottom of my rear garden and I have a small pond also. There are slowworms and sometimes a grass snake (both harmless and the latter quite rare). The first photo was taken in 1997 - when the beech hedge was planted. 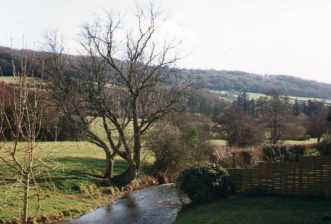 The view from my rear garden again from 1997: nowadays rather more obscured by hazel trees. It is an easy, mostly level, and safe 2 mile cycle ride into Sidmouth via 'the Byes' cycle path. Part of the rear garden can be seen here in 2012. The whole of the rear garden is now suitable for camping - or you can use the front lawn if you prefer and if there are no motor homes or caravans expected. (number of people, ages, occupations, size of caravan / tents / motor-camper, required dates, etc). I will try and reply promply. In late August 2017 a family of seven travelled from Ellwangen in central Germany for a holiday in Devon in this VW Transporter. After a few days camping in my garden they spent a week on Dartmoor and travelling into Cornwall before returning home. This was outside of FolkWeek - hence there was room for their vehicle on the front lawn as well as three tents in the rear garden. My rear garden has room for about 7 small tents - these three take up about a third of the total available area but are closer together than normal owing to belonging to one family group. Bicycles can be chained to various trees (if you wish!). Barbecues are not allowed because of proximity to the house and maybe to other tents. Mobile phone or tablet charging is available. WiFi is usually available. View from the rear garden across the River Sid, July 2018. Commercial campsites in the Sidmouth area. 1. The official festival site at Bulverton. The main 'folk festival' campsite, which has space for a limited number of caravans and motor homes, is the Bulverton site (some photos here). Booking details are always on the official website (but no photos of what it can be like in poor weather). Be aware that you are not allowed to use this official campsite unless you purchase a season ticket or a major 'event' ticket for each day you wish to camp - the rules seem to change every year but it always works out to be quite expensive. The Bulverton campsite is not ideally suited to use of bicycles because the road from Sidmouth is a long hill - and the road is narrow in places with blind bends and fast traffic. The site is ideal for youngsters who don't mind its drawbacks - and it is close to the main late-night 'thrash-about' dance tent (the Bulverton marquee). In very poor weather parts of this campsite can be horrendous with thick mud, flooding and animal dung all adding to the heady mix. All other campsite options are not affiliated to FolkWeek. There are therefore no ticket restrictions - you pay just for the camping and facilities you use. More details are given below. For the historical record, details of the old Supporters Club scheme are given below. It was one of the many 'variations' to the Sidmouth ticket and camping structure. From 2011 you could become a Friend of Sidmouth FolkWeek - which was the central idea of the Supporters Club in years past! 2. 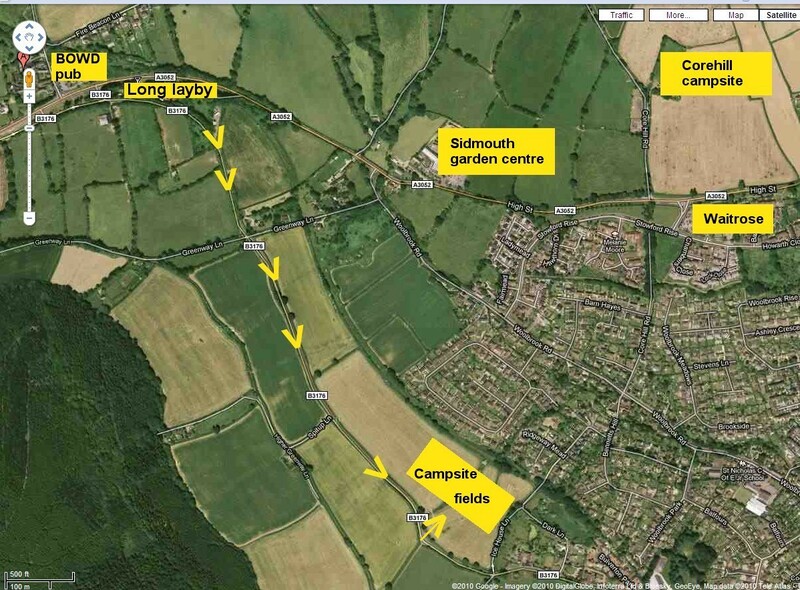 "Unofficial" commercial campsites in the Sidmouth area - these are not affiliated to Sidmouth FolkWeek. Within central Sidmouth, both Sidmouth Rugby Club and Cricket Club rent out pitches for motor homes only during FolkWeek but those on the Rugby Club are usually booked up in advance by people who return year after year. Contact the club(s) to be put on their waiting list - and expect to pay about �35-�40 per night. Showers at the cricket club are communal but apparently 'OK', those at the Rugby Club are rumoured to be 'passable'. In 2017 I was told that prices on the Rugby Club field were around �250 per week but around �400 or more on the Cricket Club field. The cricket club seems to have acquired a reputation for greed: people complain about how much money they make and what a small fraction of this they return to the festival. Certainly their car parking charges of �10 per day would go some way to accounting for the reputed �50,000 per year profit! As far as I know neither club publishes figures for their FolkWeek income and how much they return to the festival. One small alternative site which has good access by bus into Sidmouth is the Corehill campsite. It is operated by Mr Burrough (or it might be his brother), owner of Thorn Golf Centre which in 2008/2018 has hosted an alternative Sidmouth Fringe Festival: 01395 579564 but please try the mobile number below first. Prices are around �10 per night. One advantage of the Corehill quiet site is that you can stroll down the hill to Waitrose (which has plush toilet facilities!) The location of the Corehill campsite is shown on this map. The views from most vantage points on the site are spectacular. This site was still operational in 2017. Full details of the excellent camping available at the Thorn Park site are available from the fringe website. See also my own photographs from 2011. In 2012 and onwards evenings folksong events were on a smaller scale and with free entry. The Caravan Club (CC) operate their Putts Corner site (6 miles from Sidmouth along A375 towards Honiton). Tel 01404 42875. The CC also have a number of 'CL's' locally but officially you need to be a member of the CC to use these. Details are in the Caravan Club handbook and on their website. Kingstown Tail is a large site a few miles outside Sidmouth along the busy A3052 towards Seaton. The whole site is quite flat and arguably rather bleak. Salcombe Regis Camping and Caravan park is very popular with folks but gets booked up a year ahead. Tel: 01395 514303. Some camping pitches have a slight slope. It is 'a bit plusher' than Kingstown Tail but apparently more crowded. 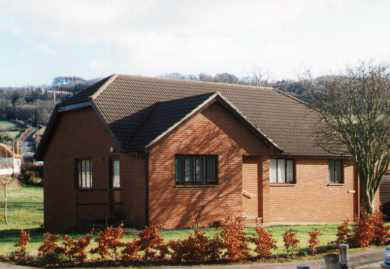 Berry Barton Caravan park has static holiday caravans for hire as well as a separate field for camping. Facilities for campers are basic (and pitches are expensive) but the views are good. 01297 680208. This is on the outskirts of Branscombe and very quiet. The static caravan field is near the edge of the cliffs and can be windswept at times - as well as foggy with thick sea mist. The site is close to the Fountain Head pub - just walk up the steep hill by the pub car park. Public transport from Branscombe village is poor - it is served by the Axe Valley 899 bus, but infrequently. 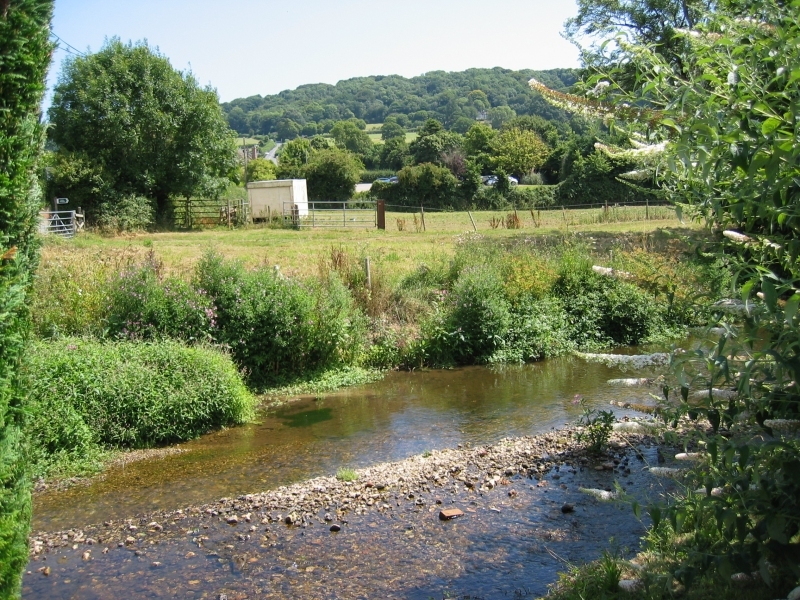 There are several camping sites around Branscombe. You are advised to view recommendations on the internet - one social dance caller at Sidmouth in 2010 had a poor experience at what he termed 'Branscombe Farm' - there is no such farm as far as I know and the description could apply to several in the area. He said there were 60 or more units, a couple of toilets and an inadequate shower block - so be warned. Remember that if you camp outside of Sidmouth and use your car for daily journeys into town you will have to pay to park either at the long stay Manor Road site (west side of Sidmouth) or on the official FolkWeek car park (which is some distance from the town) or at the cricket club (typically �10 per day but it is open only if the ground is firm enough for cars). There are other alternatives - all of them pricey. When you factor in the cost of bus passes and the inconvenience of camping in wet weather, a cheap B&B near to the centre of Sidmouth (if you can find one!) starts to look more attractive. Prices are typically �30 to �50 per night but sometimes up to �100 per night. More details of hotels and B&Bs. Two quite distinct special festival buses operate shuttle services between campsites and the town centre during Sidmouth FolkWeek. Each operates into the small hours and serves late night revellers. For the official Bulverton site, there is the festival bus and this operates on a circular route taking in the primary venues of the campsite and the town centre, via the seafront area (near the Bedford Hotel). For 2013 and onwards it also served the Stowford Rise evening social dance venue (opposite Waitrose) - different arrangements have been tried, none of them very satisfactory. Even in 2016 there were problems. It was better in 2017! The cost is about �2 per trip or you can buy a weekly bus pass. The other (and quite separate) festival bus, the 'Alpha bus', serves several of the 'unofficial' commercial campsites. It is not associated in any way with FolkWeek. The Alpha bus serves Thorn Park, Salcombe Regis, Oakdown and Kingsdown Tail camping and caravan sites and terminates in Salcombe Road, Sidmouth by the entrance to the Byes (at the end of Millford Road). Here are some comments from the 'mudcat' forum website from past years. We camped at Salcombe Regis Camping and Caravanning and it very good. Excellent showers and constant hot water + electricity for the motor-home was a boon. (Not up to Caravan Club standards but still very good). We used the Alpha Bus service which was basically hourly (with a meal/rest gap at lunchtime and evening). Last bus at 1.00 am which to be honest was a bit too early for a night owl like me). Some of the Alpha services in the evening (late evening they are every 30 minutes or so) could be very crowded. But everyone got on and there was often some singing (generally "The Wheels of the Bus.......). The two drivers (husband and wife) were very friendly and the cost was �1.50 in each direction which was reasonable. No season ticket.